Abby Koski is a publicist at Soho Press. 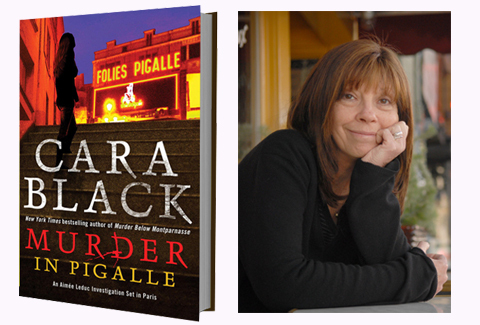 Jessica Howard, blogger at Quirky Bookworm, sat down with Cara Black, most recently the author of Murder in Pigalle, during the Tuscon Festival of Books to discuss the trickier elements of writing a long-standing series—keeping the series approachable for new readers, keeping fans happy, setting stories in the past and future, and how to change directions. Excerpts from the interview are below, the interview in its entirety is available at Shelf Awareness. Is it hard to write books that keep series fans happy, but are still approachable for new readers? That’s a great question! I never thought I was writing a series. I was passionate to tell the story in my first book, Murder in the Marais, and then my editor said, “Where is Aimée going next? You are writing a series?” and I said yes, and went to the next place she’d be. So the first book was set in 1993, and now, 14 books later, we’re still in 1998. What I realized the challenge is, is to keep it familiar, and yet fresh. I’m excited about where the series is going now, with Aimée being pregnant, and having to deal with things she’s always avoided. It’s a challenge for me, and for Aimée, and she’s going to have to grow up in some ways. Is it hard to write books set slightly in the past? To remember what technology came out when? And often I drive down to the Stanford library, and look at microfiche, and look at the newspapers for a particular day in 1998 and see who was on strike, what was on sale, what the weather was, what world events were; it helps me go into that time. Then I try to set the books with current events, like the World Cup, which was in Paris in 1998, to help people remember. Since you’re not French, what inspired you to set your series in Paris? Well, I had visited France, I read a lot of Georges Simenon, which I loved, but those are set a long time ago. I had a story I wanted to tell about a Jewish girl in hiding in Paris during World War II [in Murder in the Marais]. And then I was staying in Paris with friends, and I looked around, and no one was writing about modern-day Paris, what it was like to live there, in English anyway. I wanted to write about the people I know, where they go, not the tourist traps. So I started setting my books in different arrondissements, in the places I’d been, and seen. Do you think you could ever see yourself wanting to write something besides Aimée Leduc? There are a couple of arrondissements I haven’t killed people in yet. And my editor said that I can take Aimée out of Paris now, so maybe she’ll go to Versailles, or Marseilles, or even Prague on vacation, which is really exciting! That infuses me with a new interest in what she can do outside of her Paris base. Read the rest of the interview at Shelf Awareness.